ChangeInTerms.com has just released a new product entitled, “Tired of Credit Card Company Abuse? Make Your Own T-Shirt — Complete Kit With Templates.” While its creator, Dr. Robert Lahm, considers the work to be a parody, it contains a serious message, and was developed in protest as a result of his (and his family’s) battle with credit card companies. Users of the product can customize messages and then print their own T-Shirt artwork, if they wish to join in the protest against credit card company abuses “at any time, or for any reason, or for no reason,” quipped Lahm, who has been a stanch advocate against credit card companies’ use of similar wording in some card holder’s terms of service agreements. The kit can also be used to create and send customizable messages to anyone a user likes (just print on regular paper): “credit card companies, Congressional representatives, journalists, you name it!,” said Lahm. 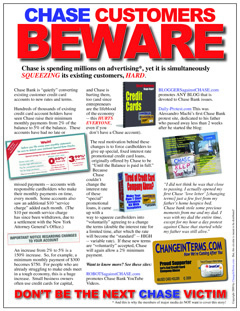 Several of this product’s preloaded messages are associated with observations about the impact that Chase’s new change in terms notice may have not just on account holders (as noted in the Wall Street Journal, and elsewhere), but on the economy at large, as Americans continue to struggle despite the bail out. The aforementioned notices were distributed by Chase over the last several weeks, and took effect as of January 1, 2009. Their primary characteristics were raising monthly minimum payments from 2% to 5% of the account balance, adding a $10 monthly “finance charge” (even if the account has no balance), and providing no “opt out,” which is contrary to a previous statement delivered by a Chase marketing executive in testimony before Congress. In the absence of an “opt out,” says Lahm, the consumer has no “escape hatch,” and is trapped. While these changes could prove to be devastating to consumers, Lahm is just as concerned about the impact on individuals who are operating small businesses. Citing SBA (Small Business Administration) figures, he has indicated that over 99% of all businesses, are small businesses. According to his academic research, about which he has previously provided testimony before before Congress himself, entrepreneurial “bootstrappers” (people who start a business with little or no capital) comprise the majority of all start-ups, and they often rely on both personal and business credit cards. In the case of his own loan with Chase, which was originally promoted as one that had a “fixed rate” of 3.99% for the life of the balance, Lahm estimates that his payments will skyrocket from $239 per month to almost $600 per month on a balance that is just under $12,000. Most of his debts (discussed on his site and in an eBook he also published entitled, “How Chase Card Services Stole Christmas“), are associated with attending graduate school, which included some challenges along the way. His intent was to become academically qualified to teach at the college level, and he is now an Associate Professor of Entrepreneurship. Lahm outlines his payment history, which he states has been flawless over many years and types of obligations, both commercial and consumer oriented in nature. ChangeInTerms.com is a consumer protest site, created by Dr. Robert Lahm (Western Carolina University entrepreneurship professor), in response to credit card companies and their mistreatment of many account holders (including himself). The site provides vibrant discussion and analysis, links to government, regulatory, and advocacy organizations, and sometimes more than a little sarcasm — along with serious critique — about the activities of credit card companies both individually, and as an industry. While the site laments that it can’t actually change terms from a legal perspective, it submits that they can be changed with credit card companies from a consumer perspective. The site’s description declares to credit card companies: NOW WE’RE COMING AFTER YOU. Posted in: "Bail Out", Credit Cards Coverage in the Media, Dirty Tricks and Traps, Join the Fight, Testimony.